It all started when I wore odd socks to work one day in 2016. I was sniggered at behind my back… going ‘crazy’ again, was the conversation. No one reached out; there was just the back chat. It was pretty poor thinking to suggest that my mental health had become worse, purely based on sock choice. A simple chat or question would have cleared that up. The actual reason I was wearing odd socks was because I had bought a dog and it had eaten all my socks; the bright colours were to cheer me up. But sadly, in health, there’s a lack of genuine chat and more background chatter. But shouldn’t we be the leaders? Shouldn’t this have started a conversation of help if it is required? A recent study by Beyond Blue found that psychological distress was significantly greater in doctors in comparison to the general population and other professionals (3.4% vs. 2.6% vs. 0.7%). 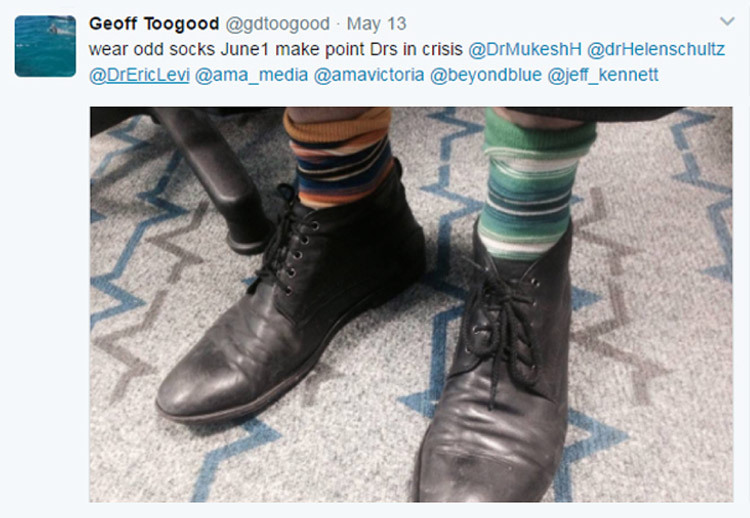 To get people talking about mental illness in the medical profession and to break down stigma, I decided to make 1 June #CrazySocks4Docs day, and encouraged members of the health profession to share photos of their odd, crazy socks on social media. People assume that doctors don’t get sick but we’re just like everybody else. The message needs to get out there that doctors need to look after each other, so that we can look after everyone else. The reason I picked the term ‘crazy socks’ is we often call people with mental health issues ‘crazy’ and I wanted to make crazy fun – instead of the mental health connotation. I think doctors are struggling generally and it’s very important to get the message out there. I’m just blown away by the support it has received. The name was partly based on the wonderful Australian sense of sarcasm and to challenge the word crazy as well as the culture, to allow doctors to feel that they could speak out. I really do not think we can, or feel very vulnerable when we do. Many times in articles and interviews, I have used the broken bone metaphor that mental health problems should be seen like a broken leg, ie not shameful and not the fault of the person with the broken leg. She’s right – a broken bone is nowhere near the same, not even close. The symptoms are vastly different. Because with depression, it is not being able to get to sleep and getting up after a night with no sleep, largely from the endless night-time ruminating. Or when you do get to sleep, the nightmares from the trauma you have seen or the bullying you have endured. It’s the dishes and house work that pile up, not through laziness but they can’t be dealt with. It’s a win if you can get them done . It’s the crying at times when you don’t know why. It’s feeling useless and a failure for having these feelings – and so much more of a failure if you are a doctor. You’re made to feel that you’re not made of the right stuff. It’s reading and re-reading pages of books because you can’t concentrate and you forget things. It’s losing your keys. Every day. It’s not buying flat-packed furniture because the thought of those instructions are beyond you; it simply would not get put together. It’s forcing yourself to exercise (which you normally enjoy) even when you don’t feel like it because you know it will make a difference. It’s that inner woody feeling when you hug your children; the warmth is missing. One of the most awful symptoms is the loss of that inner love. It’s losing interest in physical intimacy. It’s feeling angry for no reason. It’s not being able to stand noise. The morning radio shows and TV programs are avoided because that awful chatter is beyond you. It’s believing you are a failure for feeling this way. It’s fighting the demons of suicidal ideation daily. It’s starting medication and enduring the side effects. It’s not being able to get insurance because of your mental health. It’s the fear of the discrimination in the workplace. It’s booking an appointment and hanging on fighting your demon thoughts with all your strength to survive, to even get there, because there is a delay, because counsellors are stretched. So yes, Hannah Jane Parkinson, it’s SO much more than a broken bone. And just to clarify, yes I have broken my arm, my hand and my ribs. I have also suffered from depression and anxiety. They are not the same. Perhaps I will use the heart attack analogy, as I am a cardiologist and I can say that significant mental health issues are just as serious and indeed as life threatening as a heart attack. No one “commits” a heart attack and no one should be considered to have “committed” suicide or “committed” a depression. For heart attack survivors, good CPR by bystanders is lifesaving. It has taken many years of community education to reassure people who are too scared to do CPR because they’re afraid of causing harm. Just as we now know that talking to someone about suicide will not trigger it, but could save them. In heart attacks, rapid access to care is important to survival and campaigns to educate people about calling emergency numbers early have been around for a number of years. This is supported by medical teams at the ready – in many cases, 24 hours a day. In medicine, creating awareness is crucial, but it is also very much about changing the culture, so one can recognise that we or a colleague need urgent help – but we must be supported when this occurs. Too often, so many obstacles are placed in the way, often with fatal consequences. It’s about being treated seriously if you tell someone that you feel suicidal. It’s about receiving support to get help and not feeling you’re letting your team down for being absent. It’s about not feeling guilty for taking leave or time to get the help; even though appointments may not be convenient to your workplace. It’s about not feeling you will lose your job or be reported to a governing body. Just as we would not let someone sit and wait with severe pain from a fracture or chest pain, why should we tolerate this potentially deadly wait for emotional pain? We need time, a safe place and support. The health system is still lagging in this regard. Of course, it’s not just about doctors. But it is about doctors being allowed to be patients in a safe and supportive environment, with the time to recover, just like anyone else. It needs to and must change. We are still losing lives. Join the campaign today #CrazySocks4Docs @CrazySocks4Docs. If you or someone you know is experiencing depression you can contact Lifeline on 13 11 14. Dr Geoff Toogood is a cardiologist, Beyond Blue Ambassador and a passionate and vocal advocate for mental health especially the mental health of doctors and health workers. Dr Toogood founded crazysocks4docs a now International Awareness Day for Doctors Mental Health and also established an annual swim challenge for awareness and discussion about suicide. 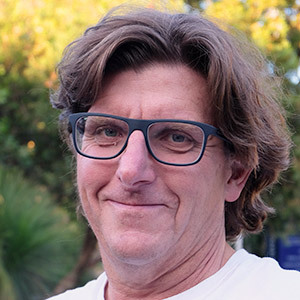 He utilises swimming for his mental wellbeing, having completed a relay across the English Channel, swum solo in the Rottnest Island swim and many other open water and pool swims.